You can remain healthy and strong only when your body has all of the nutrients it requires and in the right amounts. Imbalance of nutrients can have huge side effects on your body and overall health. Nutrients directly help and protect our body but sometimes they help indirectly by contributing in the production of important elements that are crucial for a healthy body. One such crucial element is hemoglobin. It is nothing but a protein found in the red blood cells. Proper production of hemoglobin in our body is crucial to remain fit, healthy and strong. Our body must have adequate amounts of iron, Vitamins B9, B12, C etc as they contribute to the production of hemoglobin. Obviously maintain the right count of and levels of hemoglobin are seriously important. And if you are wondering about how to increase hemoglobin count naturally and by eating right, then here’s the post you should check till the end. Today I am sharing a list of 12 of the best foods to increase hemoglobin count. If you eat them right, you will be able to easily and naturally increase the hemoglobin count in your blood. Sadly, there are many individuals especially women who are suffering from low levels of hemoglobin, which leads to several health concerns and complications. So, if the levels of hemoglobin in your blood are low, then you need to fix it fast. There are a number of ways to increase the hemoglobin count including foods, medicines, supplements etc. But one of the easiest and safest ways to increase the level of hemoglobin in your blood is by eating properly balanced and nutrients rich foods. There are many who have no idea about foods that helps increase hemoglobin count and since, this is a very common issue, especially in women, I thought of addressing it in today’s post. Today I am going to talk about several foods that can help you increase the count of hemoglobin in your blood easily. The most important role that hemoglobin plays is to transport the oxygen from your lungs to the cells in the other parts of the body which helps in sustaining them. It also carries the carbon dioxide out of the cells and takes it back to the lungs to be exhaled out of the body. So, naturally, when your body is short of hemoglobin content, you experience fatigue, dizziness, shortness of breath, chest pains, headache etc. You start suffering from anemia and in certain extreme cases; your cardiovascular system gets severely affected as well. As per Mayo Clinic, an individual has a low count of hemoglobin if there is below 13.5 grams per deciliter in males, and less than 12 grams per deciliter in females. So, you need to check your hemoglobin count on frequent intervals so that it does not go too low. But, what leads to hemoglobin deficiency in your body? Poor eating habits leading to deficiency of essential nutrients like iron, folate and vitamins B12 etc. Whatever, be the reason of hemoglobin deficiency, one thing is sure that if you have to improve the condition, you have to eat right. So take proper note of the foods to increase hemoglobin count that I am discussing hereunder. The foods you eat contain nutrients that play crucial roles in keeping you fit and healthy. Naturally, we all need to maintain a healthy and balanced diet to avoid any sort of health complications. If there is deficiency in any of the important element like hemoglobin, you can easily get rid of such deficiency by eating foods which are rich in nutrients needed for it. And if you are low on hemoglobin count, and wondering about how to increase the levels of hemoglobin by eating right kind of foods, then read on. 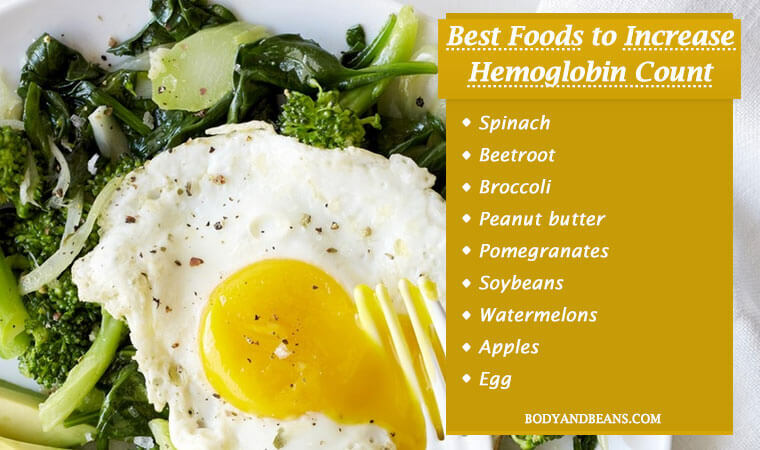 Some of the best foods to increase hemoglobin count levels include spinach, beetroot, broccoli, peanut butter, pomegranates, soybeans, watermelons, Apples, red meat and Eggs. Let us take a look at why eating these foods are considered to be good to fight hemoglobin deficiency and how you can include these foods in your day to day diet. So, are you ready? Well, here we go. One of the most power foods to increase hemoglobin levels is spinach. This green leafy vegetable is a powerhouse of nutrients and is very much needed for overall good health. But spinach is especially good to eat when you are low on your hemoglobin count and you want to increase the count quickly. Spinach is packed with iron, calcium, Vitamins A, B9, E and C, fiber and beta carotene which are crucial to help your body increase its hemoglobin levels and prevent anemia. Just a half cup of boiled spinach contains around 3.2 mg of iron which is like 20% of the requirement of iron in a female body. So, spinach is a must have food and including it in your diet can help you to increase the levels of hemoglobin counts in your blood. You can boil the spinach leaves in a cup of boiling water and add any ingredient of your choice for the seasoning and make a good spinach soup. Drink it two times daily to get the maximum benefits. You can also eat vegetable salads and add more quantity of spinach to it. To add to the greenery as well as the health benefits of the salad, add celery, broccoli, watercress and kale to it and then consume it daily. I am sure this will be very effective in increasing the hemoglobin levels. One of the other best foods to increase the levels of hemoglobin in your body is beetroot. Because of its high iron content, eating beetroots on daily basis can help you increase the levels of hemoglobin counts significantly. Moreover, it also helps to repair and reactive the red blood cells which in turn, improves the supply of oxygen to your other body parts. This stabilizes your health condition and helps you fight anemia and the other consequences of having less hemoglobin, so it’s a perfect food to eat to fix hemoglobin deficiency. You can eat beetroots in various ways and the easiest and the best one is to mix the beetroot in the salad along with the other healthy ingredients like carrot, tomatoes, bell peppers and other green veggies and eat it on frequent intervals. You can also drink beetroot juice, to make beetroot juice, you can simply peel, wash and grind it in a juicer grinder and have it along with your breakfast. Let me tell you that beetroot juice has already been proven to improve hemoglobin count in adolescent girls, so you can give it a try. Broccoli is quite popular for the health benefits it provides including helping in increasing hemoglobin counts in our body. The first reason behind it is the rich content of iron in it. Just 100 grams of broccoli contains around 2.7 milligrams of iron which is hugely required by a body low on hemoglobin counts. Also, broccoli contains other essential nutrients like Vitamin A, C and magnesium which are equally important for your system. In short, broccoli is a must have ingredient for it’ll help you to fix hemoglobin deficiency in your body. You can simply add broccoli to your veggie salad or boil the leaves and have it or simply add it to other foods while cooking. You may also like to toss the broccoli with olive oil or a little bit of butter with salt and pepper and have it. Another ingredient rich in iron and deserves a mention in the list of foods to increase the levels of hemoglobin in your body is peanut butter. Just two tablespoons of plain peanut butter have an iron content of about 0.6 mg, so eating it daily is a good way to improve the hemoglobin levels and fight anemia. If you love the taste of plain peanut butter, then make sure you eat around 2 tablespoons of it every day but if you do not like it, then you can eat handful of roasted peanuts as well. You can even mix it to your food while cooking or eat it as a bread spread along with orange juice to add to the taste as well enable quick absorption of iron by your body. I think there are very few who does not like the taste of pomegranates and if you like it, then including it in the diet is one of the tastiest ways to increase the levels of hemoglobin in body. Pomegranates contain lot of nutrients like iron, calcium, Vitamins, carbohydrates and fiber, all of which contributes in their own way to improve the hemoglobin count in your body and fight anemia. In addition, pomegranates also increase the number of red blood cells that further aids in the process and studies are a proof of that. You can eat the pomegranates daily as a fruit or you can also make pomegranates juice and drink it daily with your breakfast. Just like pomegranate, I am sure that there are many who are a fan of watermelon because it is great to taste and is certainly one of the favorite summer fruits. But, its benefits does not end there, with a cup of watermelon containing around 0.4 mg of iron, it is definitely a great fruit to increase your hemoglobin counts. Moreover, it is also rich in Vitamin C which aids in the better absorption of iron which in turn, helps in increasing the levels of hemoglobin. So, basically watermelon is not just about taste, it is immensely healthy for your system. You can simply eat it as a healthy refreshing fruit or you may like to use a grinder and drink the extracted juice on a regular basis to get the maximum benefits in improving hemoglobin levels in your body. An apple a day keeps the doctor away and so if you want to increase your hemoglobin levels, you should eat an apple a day. This phenomenal fruit is not just tasty but it is a powerhouse of nutrients. It is highly rich in iron, the most important nutrient required as far as hemoglobin levels are concerned. An apple of medium size contains around 0.31 milligrams of iron which is really beneficial. It also contains several other antioxidants which helps maintain overall good health. You can simply eat an apple everyday or you can grind it to make apple juice and then drink it regularly. If you want to do a little experimentation you can add a bit of beetroot juice to half cup of apple juice and then add some dash of ginger and lemon juice to get the extraordinary taste. Soybean is a low-fat protein-rich food that will help you fight anemia and improve the hemoglobin count much effectively. Every 100 grams of soybeans contain 15.7 mg of iron, 6 mg of Vitamin C, and 375 mcg of folate that are crucial in improving your condition. And, the most interesting part is soybean is a remedy for all. In other words, you can eat it if you are pure vegetarian and also if you are a non-vegetarian (because they generally do not have inhibitions eating veggies). So, basically, it serves the purpose of a greater majority of people, both vegetarians and nonvegetarians. To get the maximum benefits in increasing hemoglobin levels, you must soak the beans in warm water nightlong (this is to reduce the phytic acid present in it as phytic acid prevents absorption of iron). You can then eat it with some seasoning or use it while cooking. If you eat soybeans 2-3 times a week, I am sure your hemoglobin count will increase quickly. By eating eggs in regular intervals you can easily improve your hemoglobin count. It is because of the presence of proteins, iron, Vitamins and folate that make eggs very nutritious. A single egg has around 0.50 mg of iron, 22 mcg of folate and 0.55 mcg of vitamin B12 which is good enough to increase the number of hemoglobin by several counts. So, if you eat eggs 3-4 days a week, then you will be able to get rid of hemoglobin deficiency easily. You can eat boiled eggs in your breakfast every alternate day. You can also go for the poached eggs, half-boiled egg or egg scrambler in your diet. Depending on how you like, you can add it to your diet and sort out the deficiencies of hemoglobin. In many cases you must have heard that eating too much of red meats is not good for your heart, and that is true partially but you can eat them in moderate amounts especially when your body has a deficiency of iron. The vital reason behind it is the richness of iron in it. Most red meats like lamb contain heme-iron which is easy to be absorbed by your body. The heart, kidneys of the red meats has high concentration of the iron but it is the liver that has the maximum iron content. It is said that the liver of beef has an iron content which is more than 600% of the daily iron requirement by our body. The red meats also contain high amounts of Vitamin B12 which also adds on to the good effects. So, you may like to include red meats in your diet to fix hemoglobin deficiency, but then, avoid overeating red meats. If you are on a serious condition of anemia and your hemoglobin content is too low, I would recommend you to eat red meats around 3 ounces at least two times weekly. And, include the livers especially around 3 ounces of beef liver in your diet as it will also help to increase the count of red blood cells in body. However, there is no need to overdo and once your condition stabilizes, you may reduce the frequency of eating red meats. You can make nettle tea your favorite morning tea if you want to increase the levels of hemoglobin in your body. This is because nettle is an herb and is rich in iron, Vitamin B and Vitamin C which help in the production of hemoglobin in body and hence your condition will get stabilized soon. It also helps improve the count of red blood cells in your body, so it is important that you add it in your diet. Take a cup of hot water and add around 2 teaspoons of dried nettle leaves. Now, allow it to steep for 10-15 minutes. After that, strain it and mix little amount of honey and drink the tea twice every day. Whole grain breads are very rich in iron. It is an excellent source of non-heme iron and it can help you immensely in improving hemoglobin count in your body. Just a single piece of bread contains around 6 percent of daily iron requirement for your body. So, the more you eat, the more your body gets the iron. However, the whole grains which are used to prepare the bread contain phytic acid which is known to prevent the absorption of iron but lucky for you, that the bread is made through the fermenting process which makes the phytic acid inhibitors much lowered. You can eat 2-3 whole grain breads every day to increase the levels of iron and hemoglobin in your body. Over to you: which foods do you eat to increase hemoglobin levels? Deficiency of hemoglobin in body is a very common problem that many of us face. Lower levels of hemoglobin are very common among women, especially during the pregnancy. Since, it is so important to transport the oxygen to various cells in different parts of the body the deficiency of hemoglobin can take big toll on health. So, those who are suffering from hemoglobin deficiency should increase the count of hemoglobin levels to avoid other health complications. Now, whenever you are ill, an expert doctor’s advice is always welcomed and recommended but besides that, the foods you eat or the diet chart you follow also creates a huge difference on your health. In fact, foods have direct impact on your physiological functioning and so eating healthy and nutritious foods can solve many of your health concerns. And there is no exception in case of increasing hemoglobin levels as well. There are various healthy foods which can balance the levels of the other nutrients like iron, vitamins, calcium, folate, fiber etc. in body which in turn, will help in the production of more hemoglobin and will help you stabilize your conditions naturally. I have already shared the list of 12 such power foods that you can eat to increase the levels of hemoglobin in your body. These are just the perfect and nutritious food items that will work wonders and help you become strong and healthy easily. However, I would also request you to avoid the foods like coffee, cola drinks, beer, wine etc. as much as you can as these can actually block your body’s ability to absorb iron, which is very much needed to increase hemoglobin levels. Besides incorporating some of these foods in your everyday diet, you must also do regular exercises as that will also contribute in increasing hemoglobin levels. Well, you may be wondering how but exercise actually increases your body’s demand for oxygen throughout and to meet the requirements, your body produces hemoglobin much efficiently. Ever faced hemoglobin deficiency? What did you eat to get rid of it? Know of any other foods that can help increase hemoglobin levels? Feel free to share by commenting below.